Can Japan Protect Its Interests in the Middle East Without Alienating Trump? 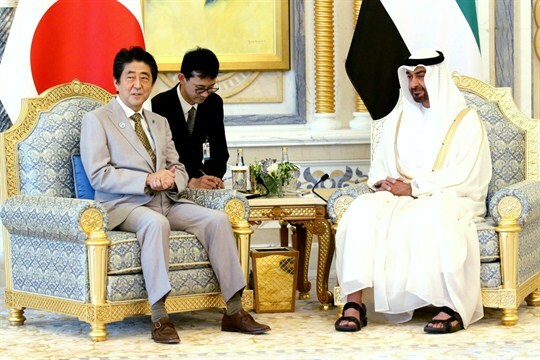 Japanese Prime Minister Shinzo Abe and Sheikh Mohammed bin Zayed Al Nahyan, the crown prince of Abu Dhabi, hold talks, United Arab Emirates, April 30, 2018 (Kyodo photo via AP). Japan has been telegraphing its concerns to the United States about the potential impacts of the Trump administration’s decision last month to pull out of the Iran nuclear deal. One Japanese official recently acknowledged Tokyo’s anxieties that it may be forced to cut off Iranian oil imports, which have resumed after the nuclear agreement was inked in 2015 and currently total some 170,000 barrels per day. An official from Japan’s Ministry of Economy, Trade and Industry recently indicated Tokyo does not want that to change and hopes for an exemption from sanctions the U.S. is preparing to impose again on Iran.